Black Mountain of Maine was the site of the Eastern High School Qualifier Shootout on February 24th. The shootout consisted of 2 runs each of Slalom and Giant slalom. Racers scored points based on their top finishes in each event. On the girls side, Brooke Juneau of Fryburg Academy and Annesley Black of Cheverus High School were tied for the top spot. Juneau had a first place finish in the first run of the GS and a second place finish in the second run. Black was equal to the task, coming in second in the first run GS and first in the second run. The girls reversed their finishes in the slalom Event. Marielle Pelletier of Mt. Blue came in third. In the boys race, Marshwood High School's Sean Maguire was the top scorer with a first place in Run 1 of the GS and a first place in Run 2 of the Slalom. AJ Noyes of Falmouth HS had the second best total with a second place in Run 2 of the GS and first place in Run 1 of the Slalom. The top 12 male and female skiers will represent Maine at the Eastern High School Championships at Attitash Mountain, on March 7th, 8th, 9th, and 10th. The 7th is a training day. Women & Mens Slalom will be held on Friday 3/8 while Saturday is the Women's GS, Sunday is Men's GS. 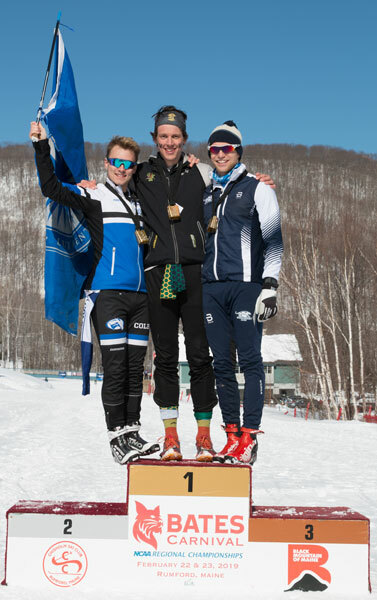 Black Mountain's 2018-19 Nordic Race Season came to a close Saturday, March 2nd with the Eastern High School and U16 Championship Maine team qualifying races. 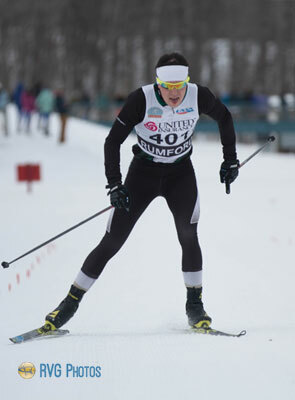 Skier's were competing with the hope representing Maine in the New England Nordic Ski Association's U16 Eastern Championships in Bethel from March 8-10 and the EHS Championships at Fort Kent from March 15-17. The morning began with the men's 5k classical interval start. Leavitt High School's Roy Varney was the first to cross the finish line, completing Paul's 5k in 13:34.3. Second place was a dead heat, with Falmouth HS freshman Nate Livingood and Maranacook's Carter McPhedran both finishing in 14:01.9. The next thee finishers were Gabe Fein of Maranacook, Ethan Livingood of Falmouth, and Samuel Smith of Mt. Blue. Nate Livingood's time was the top U16 finish. Leif Harvey of Greely was second in 14:36.9. 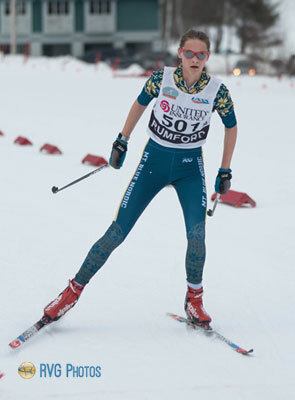 Third place went to Caden Cote of Central Maine Ski Club, who finished in 14:53.2. Rounding out the top 6 were iguel Sanclemente of Fort Kent, Utah Bena of Gould Academy, and Ben Horrisberger skiing for Portland Nordic. In the women's 5k classical, it was Mt. Blue freshman Emma Charles grabbing first place overall, completing the course in 15:24.8. Isabelle Jandreau of Madawaska came second with a time of 16:17.1. Lily Horne of Freeport was third, finishing in 16:23.1. 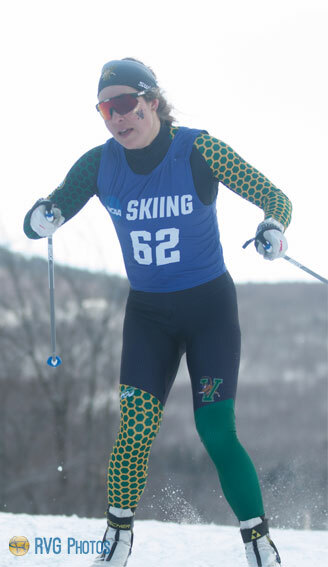 Rounding out the top six were Jennifer Wilbraham, skiing for Manfield Ski Club in Vermont, Eva Clement of Falmouth, and Zoe Maguire of Fryeburg Academy. Charles time was tops in the U16 division, with Eva Clement of Falmouth coming in second with a time of 16:28.3. Portland Nordic's Clarke Aoonte crossed the finish line in 17:15.2 to take third place. Jaidyn Negley of Leavitt, Madeline Marston of Yarmouth, and Greely's Alex Collins also finished in the top six. 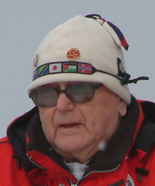 In the afternoon, skiers changed skis and poles for the 5k Freestyle Pursuit race. The men began the afternoon chasing Roy Varney, the morning's classical winner. Varney's lead held up and he crossed the finish line first, completing the course in 12:49.1 for a two-race total of 26:23.1. Ethan Livingood gained ground on Varney with the fastest freestyle time of 12:44.5, but it was not enough to catch the Hornet skier. 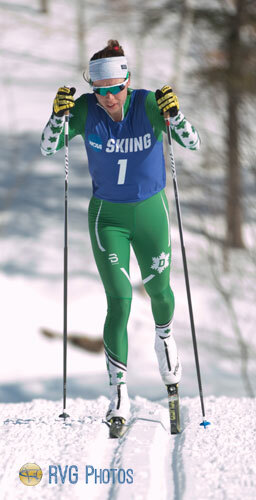 Carter McPhedran was the third high school skier to cross the line. Nate Livingood was the first U16 skier to cross the line, completing the 5k in 13:27.2. Greely's Leif Harvey had the fastest U16 Freestyle time of 13:26.3, but Livingood's held his lead. Third place went to Miguel Samclemente. In the women's high school race, Charles went out first with a 53 second head start and extended her lead, finishing the 5062m course in14:30.9 for a two-run time of 29:54.9. Isabelle Jandreau of Madawaska was second, with Mansfield's Wilbraham of Bath coming in third. The U16 girls also chased Charles, and second place went to Falmouth's Eva Clement, with Aponte of Portland Nordic taking third. The 24 member teams will now go on to compete against teams from New England and New York. The women made 3 laps around the famous Ray's 5k loop, which included 3 trips up "High School" hill. Other top ten finishers were Margie Freed of UVM, Lina Sutro of UVM, Lydia Blanchet of Dartmouth, Renae Anderson of Bowdoin, Annika Landis of Middlebury, Leah Brams of Dartmouth, and Taryn Hunt-Smith of Dartmouth. 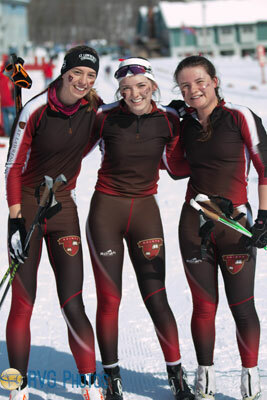 Rumford native Stephanie Nicols, a freshman at St. Lawrence University, finished 28th in a field of 61 skiers. 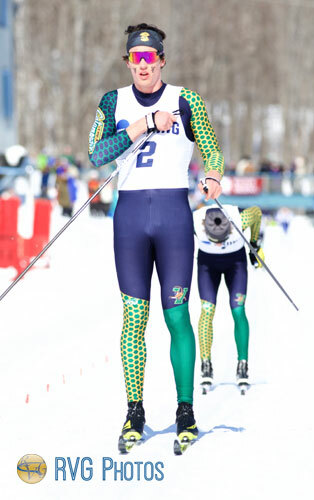 University of Vermont's Bill Harmeyer captured his second gold medal, or in this case a cowbell, at the NCAA© Regionals during the Bates Carnival in Rumford, completing the 20k race in 52:49.6. It was the second win in as many days for the South Burlington native, as he won the 10k freestyle race on Day 1 of the competition. Harmeyer's teammate Ben Ogden, a freshman from Landgrove, Vermont who dominated on these trails last year at the Eastern High School Championships, came in second with a time of 52:50.8. Third place went to Dartmouth senior Callan DeLine, a Vail Ski and Snowboard Academy graduate from Avon, Colorado, who completed the foul laps in 52:51.2. Rounding out the top ten were Finn O'Connell of UVM, Sam Wood of Middlebury, Ian Moore of UVM, Zane Fields of Colby, Lewis Nottonson of Middlebury, Sam Hodges of Middlebury, and James Kitch of Harvard. 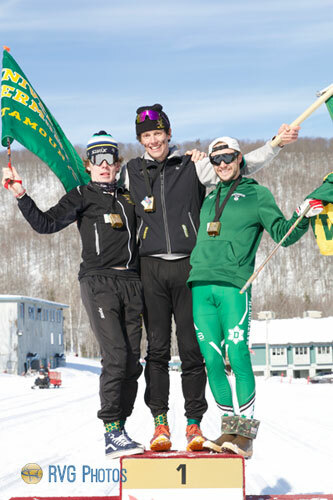 Bill Harmeyer, a University of Vermont junior from South Burlington, won the 2019 Bates Carnival 10k Interval Start Freestyle race on the John Roderick trails at Black Mountain on February 22. Harmeyer, a EISA All-East First Teamer last season, completed the course in 23:40.5. In second place was Zane Fields, a Colby College senior from Woodstock, Vt. The 2018 NCAA© All-American finished the race in 24:02.5. Taking the bronze was Middlebury College senior Sam Wood, a Harpswell, Maine native and Mt. Ararat HS graduate. Wood's time was 24:04.9. Top ten finishers in these NCAA© Regional Championships included Lewis Nottonson of Middlebury, Karl Schulz of UVM, Elliot Ketchel of Bowdoin College, Lallan Deline of Dartmouth, Peter Wolter of Middlebury, Ben Ogden of UVM, and Finn O'Connell of UVM. The Bates Carnival Nordic races conclude tomorrow with the Men's 20k Mass Start Classical, which is slated to begin in Chummy Broomhal Stadium at 12:00 noon. 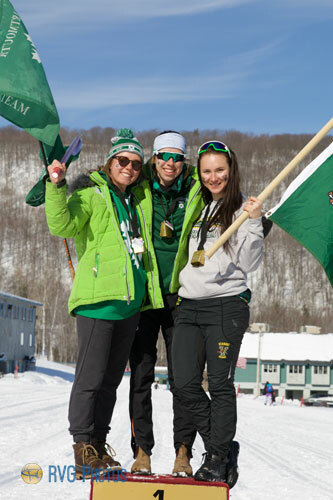 Lina Sutro of the University of Vermont captured gold at the initial race of the 2019 Bates Carnival at Black Mountain Ski Area in Rumford. Sutro, a sophomore from Carbondale, Colorado, outskated her opponents to win the Women's 5k Freestyle with a time of 13:02.0. Second place went to Dartmouth Senior Lydia Blanchet of Anchorage, Alaska with a time of 13:04.9. Taking the final podium position was Katharine Odgen, a Dartmoutn sophomore from Landgrove, Vermont. Other top 10 finishers were Lauren Jortberg of Dartmouth, Margie Freed of UVM, Taryn Hunt-Smith of Dartmouth, Anna Bizyukova of UVM, Annika Landis of Middlebury, Leah Brams of Dartmouth and Emily Hyde of Dartmoutn. Rumford native Stephanie Nicols, a 2018 Gould Academy graduate now skiing for Saint Lawrence University, came in 38th in a field of 62 skiers. The races, which serve as the NCAA© Regional Championships, continue tomorrow with the 15k Classical Mass Start at 10:00 am.